But here's the biggest news: Apple is using the same Qualcomm chip as the Droid Pro 'World Phone.' The Qualcomm MDM6600 chip supports HSPA+ data rates of up to 14.4 Mbps and CDMA2000® 1xEV-DO Rev. A/Rev. B. This chipset supports both GSM and CDMA—which means that Apple *could* have supported GSM! Why didn't they? It may be that it was easier to design antennas for a CDMA-only phone—this phone supports two cellular frequency bands, while Apple supports five bands in the GSM version. But this is a sign that Apple may be considering unifying the CDMA and GSM iPhones in the future. 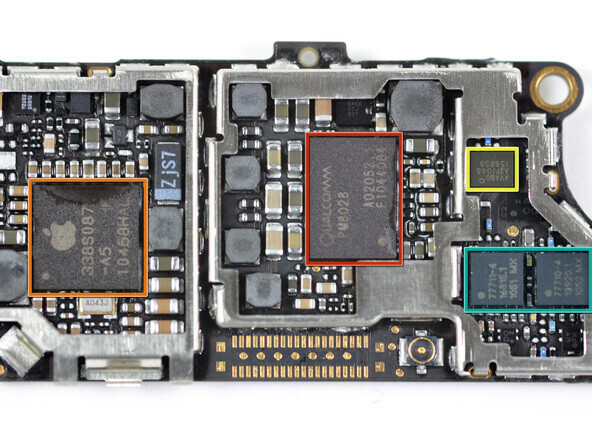 Be sure to watch the video and checkout the full teardown of the Verizon iPhone 4 in the source link below. Yet no word on which screws are being used to put the phone together? Seems like a big oversight in the review.